The human brain is a funny thing. It's perfectly capable of learning new things, solving problems, and applying logic to complex situations. But the brain also makes shortcuts, incorrect estimations and guesses, and false connections between unrelated events. What's frustrating to those of us who would like to live logically is the fact that we often tend to congratulate ourselves on our rational thinking — meanwhile, the brain is in the middle of making a logical mistake with lasting repercussions. It can be very difficult to identify a logic trap while you are in the middle of one. But it is important to know the common ways that the human brain will let you down, so you are prepared when you find yourself succumbing to illogical thinking. 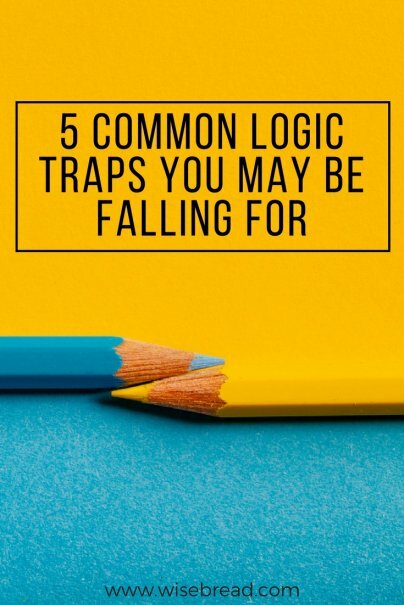 Here are five common logic traps that plague our thinking — and some suggestions for overcoming them. Correlation refers to a relationship between two things. For instance, sales of ice cream often correlate with high temperatures. As thermostats go up during the summer, so do sales of Ben & Jerry's. Interestingly, the murder rate also goes up at the same time as ice cream sales. If you fall into the logic trap of believing that correlation means causation, then you might wonder if ice cream causes homicidal urges — rather than recognizing that both murder and ice cream sales might be tied to another cause, such as high temperatures increasing both irritability and cravings for sundaes. Many conspiracy theories rest upon the logic trap of believing that correlation means causation. For instance, belief in the link between vaccines and autism (which has been definitively disproved) often rests on the fact that autism diagnosis rates have gone up along with vaccination rates. However, there are several non-causal possibilities for that correlation, including changes in how autism is diagnosed and improvements in health care options for children over time. When seeing trends that are correlated in some way, ask yourself if there could be another factor that could influence both trends. Even if you are not able to identify what that specific influential factor is, just the exercise of thinking about additional influences can help you to remember that correlation does not imply causation. When presented with two options, we have a tendency to immediately assume that they are mutually exclusive. For instance, the national dialogue on the issue of work/life balance starts with the exclusive alternative trap. We think of work and life as two separate spheres, rather than recognizing that all of our time is our life. But living and working does not have to be a zero-sum game, and thinking of it that way can be detrimental to living a life (which includes working a career) that you enjoy. You may recall the bombshell from the summer of 2014 that Hello Kitty is not a cat. According to her creators, she is a little girl. As proof, the creators point out that Hello Kitty is never seen on all fours, and that she walks and sits like a biped. This very odd detail about a beloved cartoon character can help you to remember that alternatives do not have to be exclusive. Americans see Hello Kitty and think "cat" because of her feline face, while Japanese see her and think "girl" because of her clothes and the fact that she walks upright. As a matter of fact, they are both right, because Hello Kitty is a fictional cartoon character that does not have to be one thing or another. Anytime you feel that there are only two mutually exclusive options, remember Hello Kitty and try to see if there is an option that allows for both alternatives. This particular trap is an excellent way to simply stop thinking about a problem rather than solve it. For instance, let's say you struggle with your finances. You could work hard on getting out of debt and avoiding spending temptations and investing — or you could decide that only superficial people care about money. If you go with the second option, you have "solved" your money struggles by defining yourself as the sort of person who is too moral to care about money. But solving something by redefining it is a good way to kick a problem down the road, since your money struggles are not going to go away just because you have defined money concerns as superficial. Check in with your definitions every once in a while. Robert E. Horn of The Lexington Institute points out this logic trap: "Definitions are never totally binding. Meanings erode over time. Words have temporary validity. Meanings — the relations of concepts to words — require periodic checks." If you have decided that something is not a problem because of its definition — "friends with benefits" is a prime example — then it's a good idea to revisit the meaning of your definition occasionally to determine if it is still valid. Forever changeless is just what it sounds like. We have a tendency to believe that the way things are now is how they will be forever. You have fallen victim to the forever changeless trap anytime you have been surprised at how much a younger family member has grown since you saw her last. The forever changeless trap is also one of the ways that many high-income earners can get themselves in financial trouble. They often assume that their great salary will continue forever, ignoring the possibility of layoff, disability, or other life changes. It is almost impossible to recognize the forever changeless assumption when you are making it. For example, when my oldest child did not let me sleep for the first few months of his life, I believed that motherhood was going to mean perpetual exhaustion for years and years. If I had really examined that idea, I would have recognized that my son would eventually get the hang of sleeping. But I wasn't able to see that there was an end to that portion of parenting because I was in the thick of it. Since it is so difficult to recognize the forever changeless trap while you are in it, the only way to fight this trap is to be open to changing your view of things when new information comes in, and use that information to create a more nuanced view of situations. When you fall into this trap, you look at something that is an ongoing process as if it were a single event. This trap is very common with any kind of self-improvement plan, such as budgeting. People will often create their budget in one fell swoop, and congratulate themselves on being done with it. Unfortunately, this ignores the fact that a budget needs to be a living document that you work on regularly. Otherwise, when your circumstances change (which they inevitably will), you will be financially unprepared. Similarly, getting in shape and getting organized are also often viewed as one-time events, rather than processes. That means anytime you try to improve your life in one of these areas, you tend to fall back into old patterns after your big "event" of exercising/eating right for a month or cleaning the house in a mad frenzy. Think of self-improvement as being similar to your laundry. You don't expect to only do your laundry once. You recognize that laundry is something you need to revisit on a daily or weekly basis — or else you eventually risk having to go naked. Similarly, self-improvement is not a once-and-done event. Like your laundry, you need to revisit it regularly and see it as an on-going process. How do you steer clear of logic traps?